Laura and “Elle” have been extremely competitive in the Dressage Arena from the very beginning. 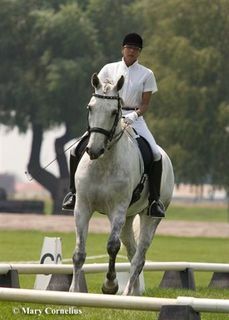 In 2007 the pair won the Oregon Dressage Society’s 3rd Level Adult Amateur Championship and the USDF Region 6 3rd Level Adult Amateur Championship. Laura and Elle are currently preparing to show 4th Level during the 2009 show season.